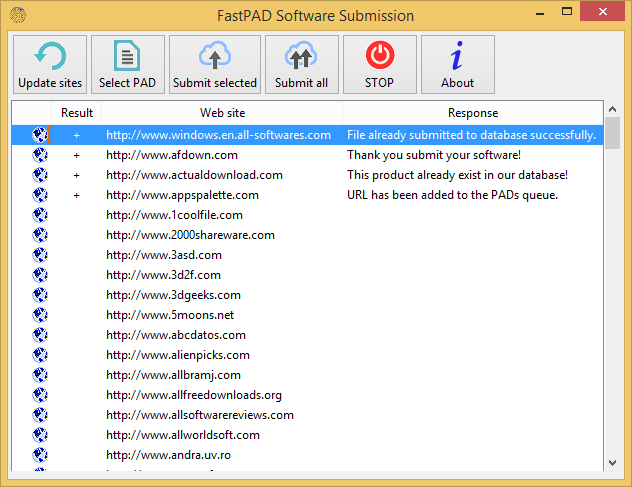 Speed the promotion of your software by automating PAD file submission with FastPAD, the FREE PAD file submission app. FastPAD submits your software to hundreds of software archives absolutely free. See results and site responses in real time. Enter captchas reliably within the app. Submit to specific sites or all sites. See your submission history whenever FastPAD opens your PAD file at any computer. Resubmit whenever necessary. Go to problem sites with a single click. Refresh the site list instantly at any time. For Windows 32- and 64-bit PCs from XP to 8.1.